Like a Mini Christmas in June!!! So I cannot help but to share a quick pic because the FedEx man delivered me a mini Magpul and Oakley Christmas today! 15 new PMags and a brand new pair of Oakley Flack XLJ shades curtesy of US Standard Issue! Put good in, get good out. Awesome! It's great to see the PMags back on shelves and in delivery boxes. Merry Christmas Davis! artwork courtesy of a good friend on the forums! I know. I've had the mags on order for over 3 months and they finally shipped a few days ago. I'm just happy to have some new mags and to have paid normal prices for them. BUT... my concern is that we are currently in the eye of the storm and people are once again becoming complacent and getting a false sense of reality in our 2A security. I was just thinking that I need to get together another round of letters for our elected officials. I do not think it will be long before we see the next wave of massive attacks... but I guess I will stock up on things as prices continue to fall and take "advantage" of this reprieve before prices sky rocket again. 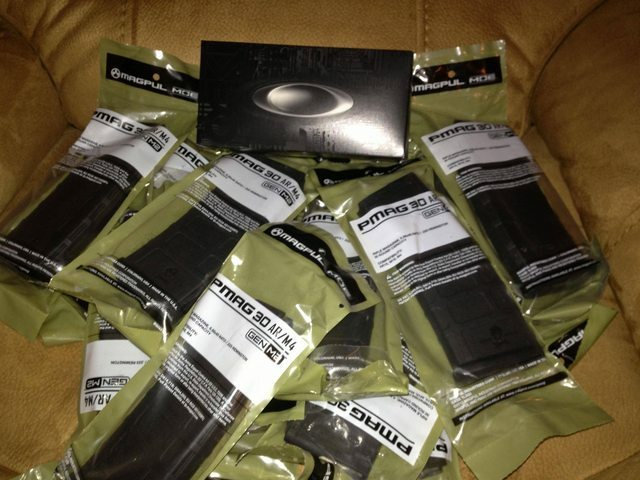 That's a whole lot of Magpul goodness and freedom right there! Yes sir, yes it is. And to make my my "June Christmas" even better I got a Box of Awesome from ITS yesterday. So now my new Ford (also got it in June) is properly completed as it is now sporting a shiny new ITS decal on the rear window. Is There A Reason, Not to Use a B.A.D. Lever? iPhone 5 Magpul Case at SKD?